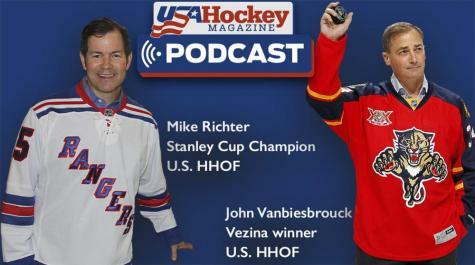 Two of the greatest American-born goaltenders, Mike Richter (Abington, Pa.) and John Vanbiesbrouck (Detroit, Mich.) talk about their current lives, the growth of goaltending in the U.S., the increase in importance of coaching in the crease and their thoughts on shootouts in this latest episode of the USA Hockey Magazine Podcast. Follow us on Facebook, Instagram, and Twitter for more from USA Hockey Magazine. The next podcast features Bob Wasno, co-head coach of Florida Gulf Coast University’s ACHA DIII club hockey program. Wasno is doing some remarkable things with the Eagles both on and off the ice. Stay tuned, as the episode goes live on Thursday, Sept. 27.